We decided to throw a snowman party this January, as it is a typically boring month, following Christmas. We allowed our 2 girls, ages 9 and 6, to invite 2 friends each. The invitations were simple; we cut out a snowman so the invitation opened at the bottom. They said Frosty the Snowman Was a jolly happy soul With a corncob pipe and a button nose And two eyes made out of coal! Come to our Snowman party! January 23rd 6:00-9:00 p.m. Hosted by _____ and __________ at (address) Please wear your PJ's and bring a pair of mittens for some indoor snow fun." We then tied a piece of fabric around the snowman's neck to hold them closed added a hat and buttons down the front and a hand-drawn face. Decorations: I kept out all the snowman-themed decorations from Christmas and we put them all back up. We spent a few weeks making snowflakes found in the January issue of Family Fun. We hung them all from the ceiling in the 3 rooms we used. We also made snowflake window clings also from Family Fun and put them on the dining room windows. We were going to build a snowman in the front yard with a welcome sign but the snow melted too much by the party date. We also planned on putting up white and blue Christmas lights in the house but ran out of time. Food: we ate first as the party started at dinnertime. We had creamy baked potato soup with baby carrot "noses" and 2 peppercorn "eyes" floating on top (resembling a melted snowman); a bread ring made from Rhodes rolls in a Bundt pan and milk that I served in tall clear glasses with a donut hole on a straw for the head with clove "eyes" and a piece of fabric tied around the rim of the glass for the scarf. I found this idea online not sure where. Then we gave the girls all a flour tortilla and a pair of kitchen scissors. They cut their own "snowflakes" out of the tortilla (same way you do for paper) and we fried them in a pan and dusted them with powder sugar "snow" and gave them back. To keep them all separate while they were cooking we had them all write their own names with a sharpie on a paper plate and used the plate as a serving plate for each girl. Then we gave them all a "snowball" which was a ball of vanilla ice cream rolled in coconut and we allowed them to drizzle chocolate and caramel over their snowballs. Just a note though only one of the six girls liked coconut in any way so it was a bit of a fight for the 3 coconut-less snowballs. You may want to omit the coconut and substitute flaked white chocolate instead or even white sprinkles. 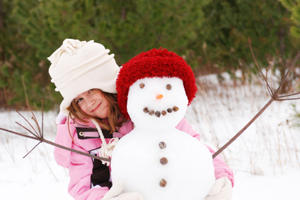 Activities: First the girls threw "snowballs" in the snowman bucket. It was just white balls I had that they tossed into a tin bucket painted to look like a snowman. They had 3 chances to get the balls in. Second we did a snowman scavenger hunt. I cut out all the parts from fun foam for 2 12-inch tall snowmen and hid them in different rooms in the house. I told the girls which room held what parts and they searched for the part of the snowman starting with the bottom ball and ending with the scarves. We divided the girls into 2 teams by age and the first team to have all their snowman parts put together on a piece of blue butcher paper I hung from the wall won. It was a close tie but the little girls won. While I was getting the next game ready I gave the girls crayons and markers and they decorated the snowmen and scenery (it bugged them that the snowmen didn't have arms). Third they did a snowman relay. I put together 2 boxes of things a snowman would wear: big boots scarves hats mittens brooms and a carrot nose (which I made from orange felt and elastic that the girls put around their heads over their own noses). We divided them up again by age and each girl would run to the box put on all the snowman stuff hold the broom then they'd have to do a "snowman dance" which I let them decide how a snowman would dance then they took it all off and ran back to tag the next person. They had fun with this one and the dancing part was hilarious. Next we had planned on bringing in snow in boxes and building miniature snowmen and outfitting them with miniature clothing but the snow had been rained on and was not good for building anymore. Next we did a snowman craft from OTC. While the girls were busy working my husband costumed himself as the Abominable Snowman in white clothing a white pillowcase over his head and white bear claws we found at the dollar store before Halloween. He snuck downstairs while the girls had their attention diverted and started softly growling. I played along saying "what was that noise?" After a few minutes my youngest daughter raced into the other room to find her dad but when he jumped out and growled she was caught off guard by the costume and started bawling. The other younger girls did too so he had to pull off the mask quickly to reassure them. It was hilarious but we felt bad for scaring the younger girls so badly. This would probably be best if you were to do this with kids 9+. The younger ones get too frightened. The older girls however loved it. We ended the night with reading Snowmen at Night. We had planned on having them watch Frosty the Snowman but the kids opted to play instead until we took them all home at 9:00. My girls and their friends loved this and want to make it a yearly tradition. "